If things seems a little quiet around here as of late it's partly because I've been preparing for taking a group round the British Museum this Saturday. It's something I've wanted to do for quite a while but there's a good amount of research to be done, and lots of other bits of pieces to do to get life back on track after my holiday. Anyway, as I've been reading about some of the exhibits in the museum that relate to the Bible (of which there are many) I've been thinking about how such archaeological finds impact Bible films. Various Bible films make claims for accuracy, but to what extent does this rest on the archaeological evidence. There are three areas I've though of so far which might have benefited from the exhibits in the museum. 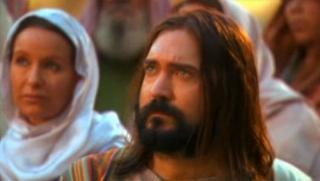 The first is in Moses films, such as The Ten Commandments (1956). 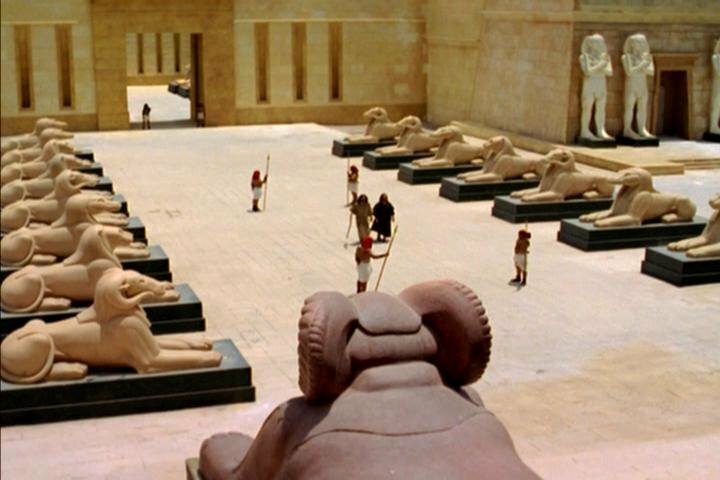 The props in the picture above obviously draw heavily on the remaining sphinxes (sphinges?) in Egypt, but, to my eye at least, there's also a reliance on the BM's statue of Ramsees II. DeMille's film (which produced a book documenting its research) isn't alone to draw on this statue. the film's namesake from 2006 includes some similar images in this courtyard shot. Secondly, there is also the introduction to the Living Christ Series which starts with the ministry of Isaiah and includes a shot of the 5 legged bulls which stand proud in the museum. OBscure but notable certainly. Te last, and arguably most surprising place that we found references to some of this stuff is in the headgear of the temple guards in various Jesus films. In Jesus of Nazareth, The Passion of the Christ and BBC's The Passion we find the Jewish guards wearing similar headgear to that found on Jewish prisoners on the Lachish reliefs. The gap of 700 years makes it questionable whether the helmets would have any similarities but it's an interesting source nonetheless. Can anyone think of any more? This morning's Guardian is reporting the uncovering of images of John and Andrew dating back to the 4th century. Probing this s little further this is a follow up story to last year's discovery of an early image of St. Paul, also in the Saint Thekla Catacomb. The catacomb, which is curiously not listed at Wikipedia, is only accessible via a door in a Vatican office building. Anyway, these are thought to be the earliest images of the two apostles, which date back to the period when the collation of the New Testament was still in process. 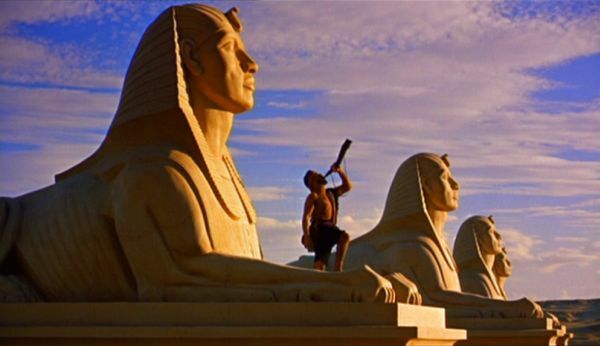 Back in 2007 I wrote various posts about the film Exodus (a.k.a The Margate Exodus) which set the story of Moses in the modern day seaside town of Margate. I've just discovered that the film is available to view online on Channel 4's 4oD as well as on YouTube, though I imagine access will be blocked in many countries. I have mixed memories of the film, partly because I remember its weakness more than its strengths. My review at the time mentioned various positives which I have since forgotten. Perhaps I should watch it again at some point. I was away on holiday last week (hence the lack of posts over the last 7 days), and as always it gives me a time to do some thinking (although not so much since we had the kids). One of the things I've been mulling over for a while was to do with changes to my site, particularly as I'm nearing the 1000th post mark. 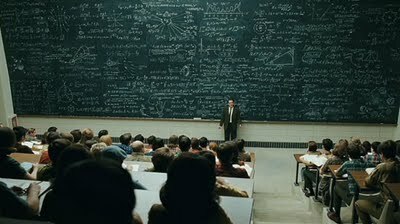 There are various factors which are making me think about some changes. First and foremost is the fact that as the blog gets bigger and bigger it becomes harder and harder for people to navigate. Then there's the growing number of posts per label, making it harder still to find earlier posts for some of the more popular films. There's also the question of screen resolution. When I last changed my template (I'm still on a modified version of an original blogger template) the screen resolution on my laptop was only 800x600, now both of the PCs I use regularly are over 1250 pixels wide, meaning a lot of useful space is wasted. Lastly there are a few good reasons to have a dedicated domain name, Wikipedia could link to me for example, I'd have a simpler domain name and I could do certain feature pages that I could do whatever I want with, plus I could actually join the 21st century. But there are downsides as well: redesigning anything would be a lot of hard work; moving the site away from blogger would make me less visible on Google, and potentially lose me the labels; there's a small cost implication; any changes I made would need to be fairly future proof, not just cover all the bases now; and on top of that there's my general discomfort with changing something that, in general, works reasonably well, particularly as there's a frighteningly blank sheet-ish-ness to the possibilities a new site offers. It might be possible to marry blogger with an independent site, but what happens to all the links etc. etc.. So I thought I open this up for ideas. I believe there are a few regular readers of this blog and I'd be interested to hear from them or anyone else who's just passing through. Do you have any useful experience I can draw on or any advice, feedback, ideas or suggestions. Which parts of my sidebars do you find most/least useful? How do you find navigating the site? Are there any other sites you're familiar with that might provide a good template? Any advice you offer would be most welcome. Over the years I've made various posts about the short series of Hebrew Bible films Testament: The Bible in Animation. Whilst these short films have been available on Region 1 DVD for a while, potential purchases have had to buy them individually, putting pressure on shelves as well as pockets. So I was really pleased to discover that the Bible Society has now made them all available on a 2 DVD box set. I can't seem to find out whether the set is region 2 or region 0, but hopefully I'll find that out fairly soon. The Bible Society never do these things by halves, so in addition to the nine films, there are also resource packs to download for teachers and church groups. The DVDs have subtitles, but seemingly no other extras. For those not familiar with the series, it was made by the same team who went on to create The Miracle Maker, and like that film they use a variety of different animated techniques across the series - although they stick to one technique per episode. Whilst the films certainly are suitable for children, they have a fairly grown up take on things - don't think for a minute that they are just for the kids - and the animated medium used is itself often very expressionistic. Like any series some are better than others, though that's due in part to individual preferences about animation styles, but overall this is a great series,with certain instalments offering the best film interpretation yet of their particular story. Keanu to Play Adam in Space? Keanu Reeves already has been locked up as the male lead, while his female love interest is still being sought for what the producers short-handed as "Adam & Eve in Space." Thanks to Film School Rejects for highlighting this one. This is somewhat off-topic, but I know a number of the readers of this blog are interested in either the Romans or archaeology, and as it interested me I thought I'd pass it on. According to The Guardian, the results of forensic tests on 80 plus Roman male skeletons found in York has suggested that they may have been gladiators. It is apparently the "best-preserved" gladiator graveyard in the world. York is best known for the Viking site that was discovered there a few decades ago. It would be nice to see York known for its Roman history as much as it is for its Viking history, particularly as my parents live relatively nearby. A documentary about the discovery, Gladiators: Back from the Dead, will be shown on Channel 4 next Monday (14th June 2010) at 9pm. Recently, I've been thinking about films about the creation of the world and Adam and Eve. In part this is because it seems to me that there are so many that I have heard of but am yet to see, and I struggle to distinguish some of them from one another. SO, just as I have previously tried to list "all" films on Noah and Samson, I'm going to try to do the same for this part of the Bible. Firstly there are the films I have seen (linking to my writings on them - though some you may have to scroll down to reach). 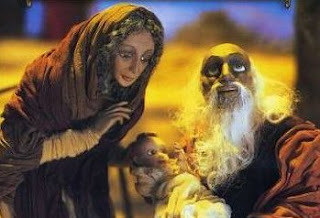 Iván Ávila Dueñas's Adán y Eva (Todavía). Leafing through the Internet Movie Database reveals a number of other likely possibilities. 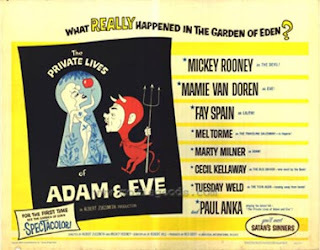 Firstly those named simply "Adam and Eve"
Adamo ed Eva, la prima storia d'amore (1983) aka "Adam and Eve"
Adam & Eve (2002) aka "Forbidden Fruit"
There is also Adam and Eve (2005) better known as National Lampoon: Adam and Eve, but from what I can make out that one has little to do with the biblical story. Adán, Eva y el diablo (1945) aka "Adam, Eve and the Devil"
I haven't had time to check the descriptions of the films on the IMDB as usually a few of them prove to be largely unrelated. So when I get another chance I'll work through all those, eliminate any spurious entries and post a complete list. Will Esther Feature in Xerxes? "There's an extended scene set in Persepolis," adds Miller, "for instance, where he [Xerxes] takes power and there are several scenes where he is going through his transitions and he's shown speaking to his mother and his wife..."
The wife is unnamed, but among the various contenders for who this might be is the biblical queen, Esther. It's true that we're unclear whether the king she married was Xerxes I, Artaxerxes I or even Artaxerxes II, and even if it was Xerxes I then it could be either his wife Amestris or even Vashti that Miller is thinking of. Nevertheless there is a chance it could be Esther. 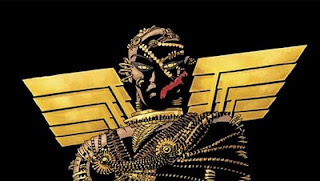 That said, Xerxes and Vashti are also biblical characters to an extent so even their portrayal would be of some relevance. It's quite interesting to juxtapose portrayals of Xerxes in Esther films with that in 300: in the former Xerxes is usually portrayed (bizarrely in my opinion) as a hero, whereas in 300, and the Greek historical sources that the film is very loosely based on, he is very much the villain. has also covered the story. I got an email a week or two back from the producers of In Our Time - a contemporary version of the story of Jesus. 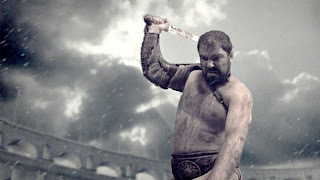 It's due to be released in December 2010 and will be distributed by Lions Gate Films. There's a handful of details about the film available in the latest press release and it also has a facebook page. There's also the beginnings of an official website with a good deal of information including plot synopsis, production locations and cast biographies. DJ Perry (pictured above in last year's Book of Ruth) will be heading up the cast as Jesus, and the actors starring in most of the main parts have been named, although only Matthew has been named amongst the apostles. There also seems to be a chance that Jon Voight and/or Richard Dreyfuss will have cameos. Richard N. Bailey has written the screenplay. According to the press release, the story is narrated by Mary which will make for an interesting comparison with Jezile (Son of Man) another modernised take on the story of Jesus (albeit set in South Africa) which places Mary very much towards the film's centre. Make no mistake: the gladiatorial scenes are pretty brutal. Limbs are hacked off with such nonchalant frequency, it sometimes feels more like an extreme whittling contest. Incidentally, this was apparently covered in the first episode in the current series of Brooker's Channel 4 show You Have Been Watching, but unfortunately, that was the one episode I missed. Juliette Harrisson has also posted her take on the series over at Pop Classics.